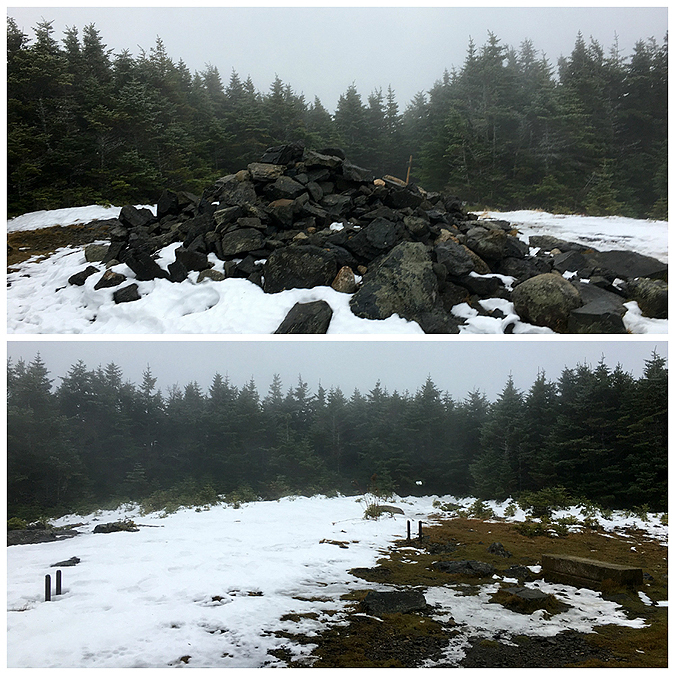 - SNOW came to the White Mountains recently, dropping close to two feet above 6,000 feet on Mount Washington over the past ten days and about a half foot plus around 4,000 feet. 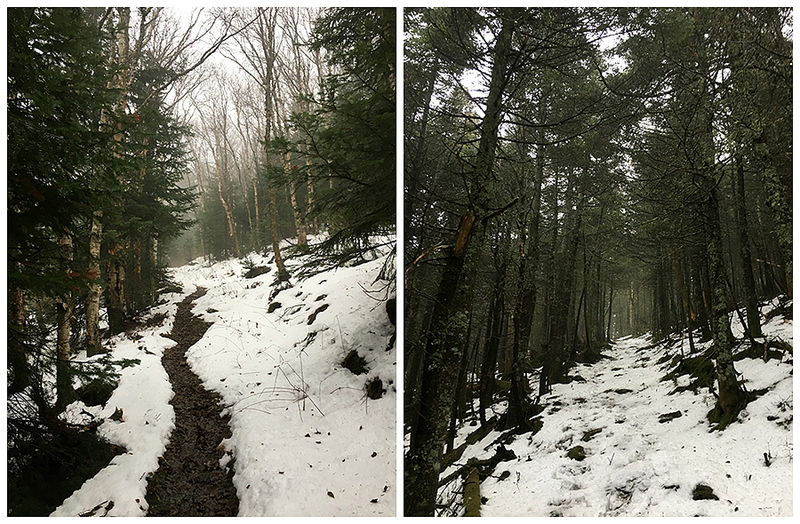 I was hoping to catch snow and ice covered Birch glades along the old Mount Hale Trail (AKA Fire Warden's Trail) but the weather on Saturday turned to rain and warmed up melting away the winter wonderland feeling. Still, there was about four inches left around 4,000 feet but not much anywhere else. - Kyle joined me for the hike up the old trail which stopped being maintained in 1957. 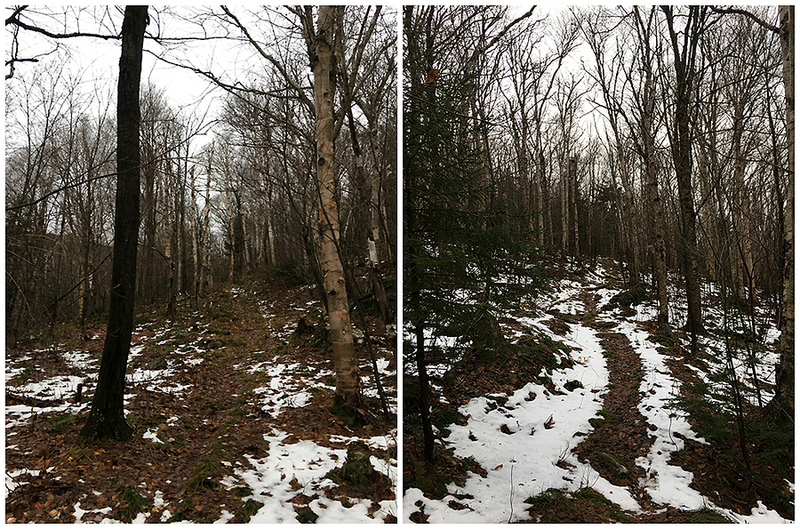 However, the abandoned trail is still easy to follow and sees quite a bit of use. The grade and footing is extremely easy as it follows the old 'tractor' road that the fire warden used to head up to the fire tower on Hale's summit. There are a few step-over blowdowns here and there but overall the trail is in incredible shape. 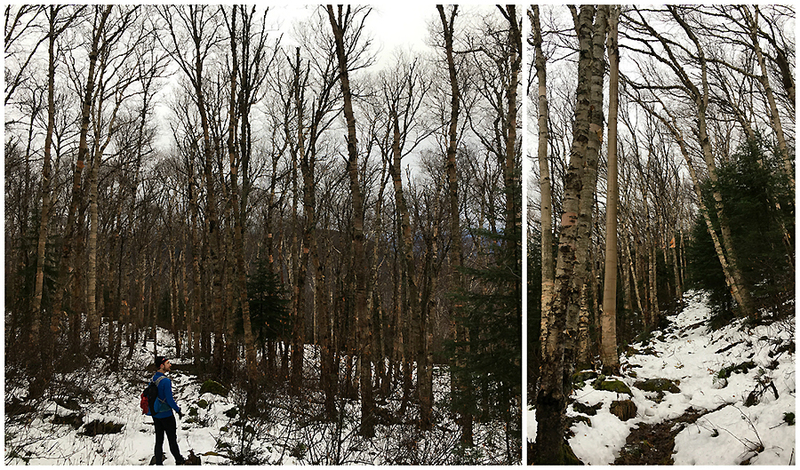 - The highlight of the old trail are the Birch glades which are very beautiful, especially during peak foliage and even more so after a fresh snowfall. Today, it took on a springtime feeling with rotting snow covering the ground. 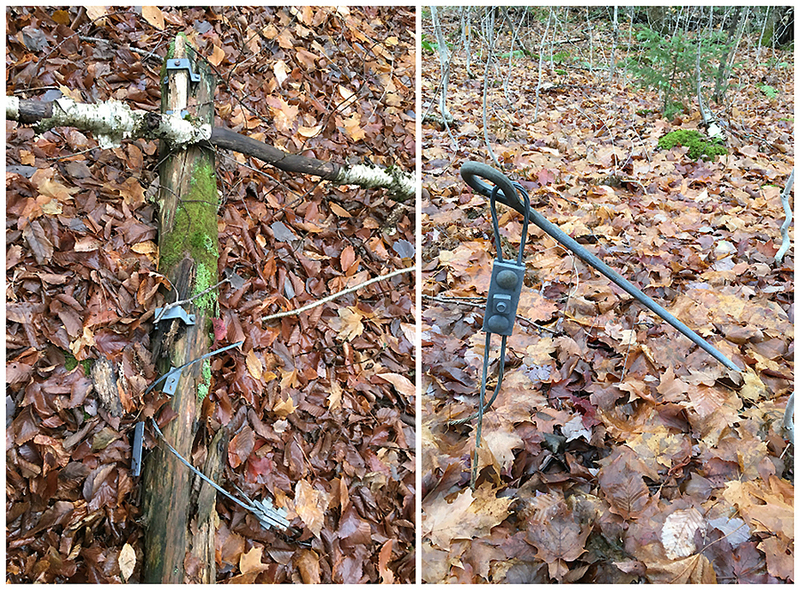 - The other interesting part of our hike was finding four old telephone poles, a few wire and hooks, and two rails on the North Twin Trail. The telephone poles ran all the way to the summit tower at one point (I think), the rails were from the Little River Railroad which was in existence between 1893 - 1900. Mount Hale Birch glades, a prime spot for back-country skiing! The always exciting summit of Mount Hale! Cool trail. A little bit of autumn and winter. 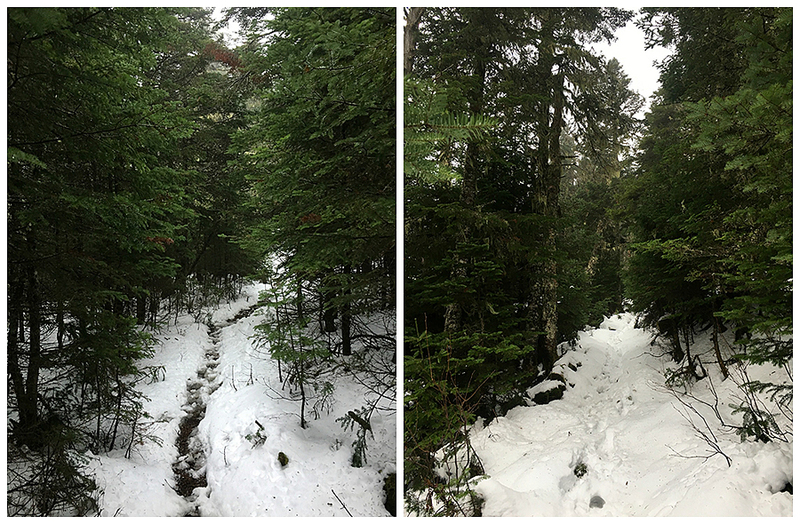 This time of year in the White Mountains the weather changes every day, you never know what the trail conditions will be every time you hike! Nice report, Chris! I'm an engineer so I'm amazed at the quality of the galvanized finish on the hooks and brackets you found on the old poles. No rust at all after so many years. You can't find that type of quality these days!!! I heard that there's an old fire wardens shack or shelter not far below the summit. Is that correct? Anything cool out there that you're aware of? Hi Karl! It really is amazing the quality of the hooks and brackets after many years of harsh weather. As far a an old shack I haven't seen it, There are a few old barrels coming up the fire warden's trail in a tiny col between the summit and a false peak but nothing else. There's also some stuff on the Lend-A-Hand Trail just below the summit. and some old tiny scraps in the woods in the woods at the summit.